Easy upload your design to make your own decks stickers. Top stickers are made of durable sand papers, the bottom stickers are made of smooth papers. Solid sand paper, anti slide and waterproof. 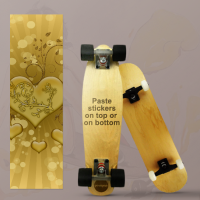 Easy cut the edge to suit your skateboard deck. You can refer to the manual in picture gallary. I think the print is perfect. It is easy to paste on the skateboard. My friends love it too. It is for my son. He likes it very much. The wood material looks better then others. Thank you for delivery on time.